It was only one game - a damn small sample - but Marcus Smart injected into the starting lineup provided the right serum for a team faltering on the edge of failure. Much of the following text is based on an excellent article by NBCSports' Chris Forsberg. Per Forsberg, Marcus stated, "This team doesn't have the same personality as past years." My personal translation of that is that this team lacks the heart and grit of past teams. My position right along has been Smart needs to be in the starting-5 to set the intense defensive tone right out of the gate. 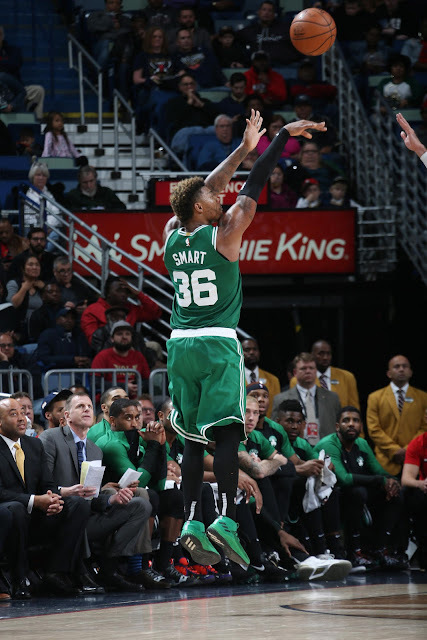 In the first quarter of the win against the Pelicans, Boston forced eight turnovers resulting in 11 points on the board. The Celtics generated a 15-point lead, largely due to that in-your-shirt defense. The Smart-Kyrie Irving pairing just clicked. The team put up 75 points in the 26 minutes shared by Kyrie and Marcus. And the shooting accuracy was 52.7% overall and 61.9% on treys. Marcus Smart is only the 5th player in the past three seasons to play 40 minutes for Brad Stevens in a regular-season, non-overtime game. Never one to over-state an issue, Brad Stevens indicated "Marcus brings a level of grit." Yes, he certainly does. Per Chris Forsberg, no Celtic has come close to playing 40 minutes in a non-overtime game this year - but Marcus had that much time on the floor versus New Orleans, and the fact he started and played that much was instrumental in the win. Stevens swears that his starting lineup is still in flux, but Smart needs to stay in the first unit. He may never be a major scorer in the League, but he directs and facilitates on both ends of the floor - and has that Kevin Garnett quality of never letting down or backing off. Danny Ainge is locked onto this guy with a chain and padlock - and for good reason. Smart's mom would be proud of him.